...choose you this day whom ye will serve...but as for me and my house, we will serve the LORD. The whole fabric of society rests upon the home. We SHOULD have written in February, when we got our little bunnies, spent a day sledding with friends, and nearly froze our butts off at a downtown festival, but we didn't. We COULD have written in March, when we went to the official start of the Iditarod, enjoyed another visit from our friend the moose, and celebrated Maya's 8th birthday; but we didn't. We WOULD have written in April, when we took a behind the scenes tour at the Anchorage Zoo, spent a weekend in Seward and celebrated the arrival of spring when our tulip bulbs burst through the soil, or in May, after the girls' ballet recital or when we went to Homer; but we had to get caught up on laundry first! So here it is, 4 months of photos and adventures crammed into one blog post! Hopefully we'll get better at this blogging thing and post again before the month is up! We adopted 3 adorable female mini rex bunnies from a young lady out in Wasilla. They share the same birthday as Kyra, January 11, and they were just the cutest, sweetest, tiniest little things when we got them! Now they've doubled in size and eat through piles of fruit scraps and veggie peels every day. They WERE named Velvet, Silk, and Satin, but since then, I've heard Ellie, Katie, and Rachel (their middle names) being used more often! No longer impressed with the little hills in our yard, we took the girls to a local park with bunch of friends from church/homeschooling, and spent the morning trying to break speed records and bones. The best part was watching her drag her own sled all the way up the hill again! Emma on the fast and dizzy disc. You can't see everyone, but I think there were 12 children riding! The end of the month was the annual Fur Rendevous celebration, commonly referred to as "Rondy". 18 degree temps and 25 mph winds made it a bitterly cold day but we got to see an outhouse race, amazing ice sculptures, and the girls got to go on a sled ride pulled by huskies! These dogs were SO excited to run! Movie characters were a common theme. The beginnings of a wooly mammoth. How do they do the wings without them collapsing? Not particularly detailed, nor is it particularly likely, considering our location, but funny, nonetheless! A gorgeous March day found us WAY overdressed but loving the sun and fun out on the frozen Willow Lake for the official start of the 2011 Iditarod. The dogs were beautiful and I tried my hand at some action shots. Mounds of snow and ice in the parking lots provided hours of entertainment for the girls, as we waited for the lines of cars to clear. ...did I mention we were overdressed? Amazing that so many people and so much equipment can sit safely on the frozen surface of a lake! A sign I never dreamed I'd see! Looks like Riley back there doesn't it? Sled dogs are much smaller and more slender nowadays than in days past. Look at the muscles on the one in front! Sweet cheeks! That hat won't fit next winter...I should start working on a new one! She didn't stay down long...the shady side of the snow hill was really cold as the sun set. Not the least afraid of heights! Emma found a big stick and hacked a seat for herself out of the icy snow. A new moose dropped by for a visit. He spent a few minutes playing with the windchimes and then wandered around, looking for things to nibble in the neighbors' yards. He probably would have stayed and played a bit longer, but Riley and Cooper caught sight of him and the barking seemd to make our "friend" a little nervous! You can see that it's a "he" a little more clearly here, his antlers were shed so we're guessing he's fairly old. After helping himself to various bits of shrubbery, the moose wandered through our backyard and up the hill into the woods. Steven caught sight of him later that evening when he went out to the workshop but we forgot about him until we went snowshoeing the next day...A warm sunny afternoon and the threat of melting snow inspired us to put them on and explore the woods behind the homes on our street. Full of chatter and laughter, we stomped up the hill, found ourselves in snowdrifts up to our hips, and inspected several different paths through the woods. Maya, in the lead, looked frighteningly small as a mountain of brown rose up about 10 feet in front of her. The moose had fallen asleep on the other side of the hill she was cresting and thankfully, he was too groggy to do much about our invasion of his space, and we backed up (not an easy task while wearing snowshoes!) and found another way down the hill! Miss Maya celebrated her 8th birthday with a homemade cake and plenty of dimples! At the Anchorage Zoo, on another cold, blustery day, we got up close and personal with many of the animals, enjoying a tour of the veterinary clinic as well as a class, craft, snack (always important!) and a walk through the zoo on the gated trails only accessible by zoo keepers. A HUGE siberian tiger within feet of us! This little guy was quite a flirt and put on quite a show while we snapped photos. What a beautiful animal! Look at those paws! We spent a weekend in Seward, enjoying local wildlife, a beautiful drive, and lots of fresh mountain air! A whale-watching cruise in Resurrection Bay was an unfortunate and desperate experience with sea-sickness for three of us. Happily, Kyra spent most of the time asleep in Steven's arms! While the waters were still calm, we saw sea otters, cormorants, young and mature bald eagles, stellar sea lions, and even enjoyed a speed race with a sea gull! After that, we don't remember much and we weren't in any condition to take pictures. I hear there were dall's porpoises but no whales! The white face indicates an aging sea otter. I love how the color of the water makes it so easy to see his dark fur! This seagull flew alongside our boat for several minutes before pulling ahead and leaving us in the proverbial dust! ...and the mate, flying in! What a noise these stellar sea lions made! It was so fun to watch them jump into the water, but even more amazing was watching them propel themselves out and back onto the rocks! A beautiful close-up of a gull in the sea life center. 1700 lbs of sea lion! I'll never get tired of seeing these beautiful birds! Exit Glacier...the road was closed so we couldn't hike up to or onto it, but we'll visit again later in the season next year. Anticipating our summer adventures, we bought a camper! It's just the right size for us: a 26 footer with triple bunks for the girls. Most of the month was spent trying to wrap up our school year (the first time in many years we have planned a summer off! ), preparing for dance recitals (Maya's and Emma's are on separate days), and stocking our camper for our trial camp (one night spent just a few miles from home), and our first big trip to Homer (4 nights away and a 5 hour drive!). SO excited about the smoke coming out of the grill...hotdogs, coming up! Look, Mama! It's eleven o-clock and I'm still ridiculously perky! Skipping rocks on the banks of the river the next morning. We spent the pre-memorial day weekend with two other families at the Homer Spit Campground at the end of the Homer Spit. 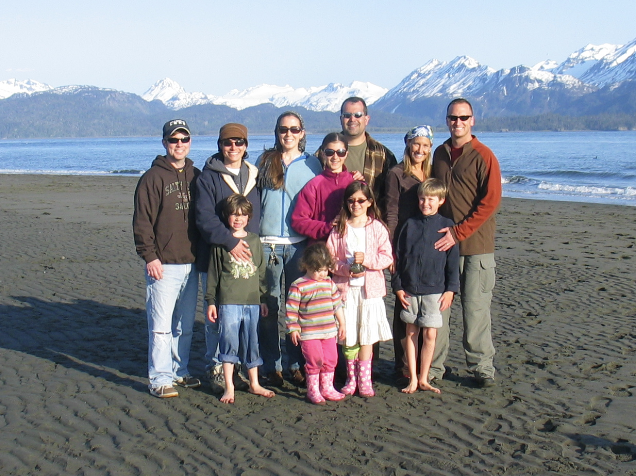 Jutting about 5 miles out into Kachemak Bay, the spit is along narrow stretch of land with rocky beaches and spectacular 360 degree views. We went fishing, explored the beach at low tide, collected rocks, shells, and shrimp, strolled around "town", and of course roasted LOTS of marshmallows! The greatest blessing, of course, was spending that time with friends. A year ago, we never would have imagined finding friends who would want to spend time with us after 3 days of not showering! Beautiful views and an exposed sand bar at low tide. Wishful thinking...no one caught anything! Getting pointers from a pro! Not sure why this eagle, nearly twice the size of the dog, was flying away, unless he though the pup would steal his meal! Crossing a homemade rock bridge as the tide rolls in! Our little naturalist, collecting treasures! The dirtiest, happiest child on the beach! It's always a "cats" game between these two. I think they were after the shrimp this time. ...they'd jump up, and when they landed they'd roar and burst into laughter! The Time Bandit pulling into port for a holiday weekend. Anyone up for a round of "chubby bunnies"? Some of our treasures...if you look closely you'll see rocks that are speckled in varying shades of white, grey, black, and even rose and peach colors. There were scarlet red pebbles, and several shades and textures of green too! We even found a large piece of lava that floated when we threw it into the water! An eagle in it's roadside nest at mile 164 on the Sterling Highway. Lovely Texas bluebonnets and wildflowers!